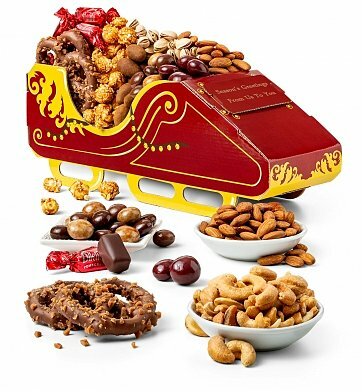 This merry sleigh arrives bearing a collection of luscious chocolates, or add premium nuts roasted to perfection and dusted with a touch of sea salt. With your personal message printed on the sleigh, this fun and deliciously shareable gift is sure to send festive season's greetings. Choose Chocolate & Premium Nuts. Personalize it! Your chosen name, date or special message can be printed on a designated space on the sleigh. Four lines with up to 23 characters each; complete the personalization info at checkout. Measures 13" x 5" x 5". Sleigh Full of Chocolate is a hand delivered gift. These gifts are delivered by one of our local design centers located throughout the United States and Canada. Same day delivery is available for most gifts when ordered before the cutoff time. The cutoff time for Sleigh Full of Chocolate is in the recipient's time zone.